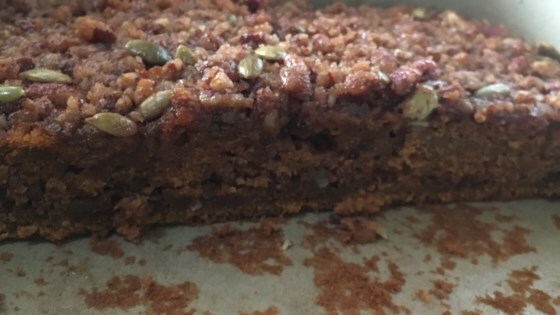 "I wanted a recipe for a pumpkin crunch cake that didn't have a layer of pumpkin pie filling. Not being able to find one, I came up with this one after a little trial and error baking wizardry. Serve with whipped topping." Mix brown sugar, pecans, flour, and cinnamon together in a bowl. Pour in melted margarine; mix until evenly combined. Combine cake mix, pumpkin puree, eggs, 1/2 cup plus 3 tablespoons water, canola oil, pudding mix, and pumpkin pie spice in a large bowl; beat with an electric mixer on low speed until moistened. Scrape sides of the bowl. Mix on medium speed until batter is smooth, about 3 minutes. Spread half of the batter in the bottom of the prepared pan. Sprinkle half of the brown sugar mixture evenly on top. Pour in remaining batter; spread evenly. Sprinkle remaining brown sugar mixture on top. If the pumpkin spice pudding is not available in your area, add vanilla extract and increase the pumpkin pie spice to 2 teaspoons.